If you have to pick a file in your app, but you don't want to implement your own file explorer; you can start a activity with intent of Intent.ACTION_GET_CONTENT. Android OS will choice a suitable app with such function for you. 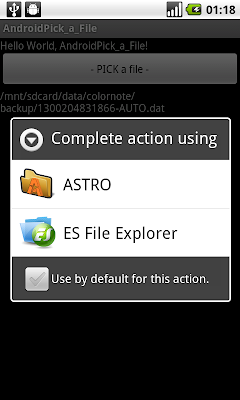 yes, this example assume user have install file explorer apps to handle intent of ACTION_GET_CONTENT. But it's not include in default Android system. Or you have to implement your own File Explorer. It's a very simple example, may be you have to do much more to make it as a completed app. 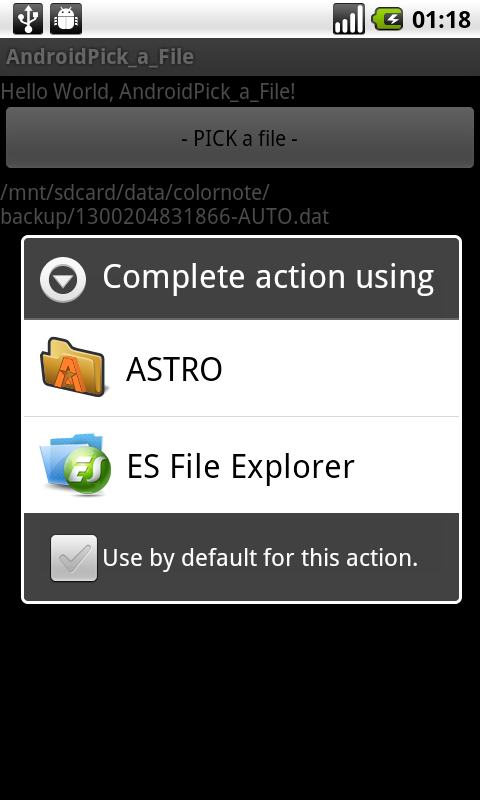 How to specify a directory path so Astro starts from there on? To pick a directory, refer to Example of using Intent.ACTION_OPEN_DOCUMENT_TREE, to pick a directory subtree.. But it work on API Level 21 upper! what you means "a single document"? Anyway, please check the link under Updated@2017-06-19 in the post. Java String Comparison: equals()? ==?